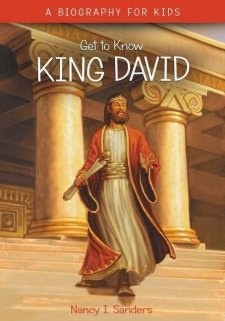 "King David: Get to Know Series" by Nancy I. Sanders is a biography on the life of David. David is one of the best known Bible characters thanks to the story of David and Goliath, but this book also highlights his life-long journey from shepherd boy to great King. This book contains special features including "Word Bank" sections which tell the definition of words that may be unfamiliar and "Did You Know?" fun facts sections. One interesting fact is that at the time of David and Goliath's battle, the Philistines were the only people who knew how to make weapons out of iron! This book is visually fascinating as it includes pictures of artifacts, maps, artwork and present day photographs. Archaeological evidence is shown that proves the existence of David. At the end of the book there is a time line of David's life that also shows when events in world history took place. The book tells David's life story including King Saul's jealousy towards him, his friendship with Jonathan and his time as a fugitive. While it mentions David's sin regarding Bathsheba and her husband, the consequence for this sin is glossed over by saying: "Then he married Bathsheba. They eventually had a son named Solomon." (pg 83). Mention is made of the story of Tamar, Amnon and Absalom, but the conflict is told in such a way that isn't inappropriate for younger readers. Readers who are older and interested in finding out more can look up these stories in the Bible. I appreciate that the book highlights David's remorse for sin as well as God's graciousness. David was not perfect, yet he has a place in the lineage of Jesus. The book emphasizes the prophecy written by David in Psalm 16:10 about Jesus' death and resurrection -- 1,000 years before Jesus' birth. Overall, this book is a great addition to any bookshelf. It gives more details than a standard children's book would and is a great read "for kids" as the book cover suggests, but also for anyone who wants a better understanding of the life of King David.